I am excited to be the CoreNET team captain for 2019. 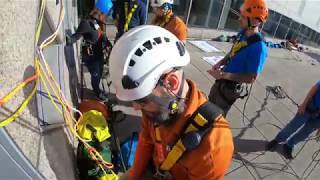 Our CoreNet team will be rappelling TWO Commerce Square, 29 stories, with Outward Bound on May 17th. AND I would love for us to be the top team fundraiser this year! This fund raising support is very dear to me. My son Billy, 16 yrs old, attended Outward Bound's 21-day Intercept program in July, 2005. He had an awesome story to tell - "How that it was the hardest thing he had ever done in his life, but was THE MOST REWARDING." Billy was then accepted into the Leadership training program in Maryland for another week. Well, he had a slip. The OB team supported him through his journey and he created forever friends. Billy died the next year in a car accident. We will never forget how Outward Bound touched his life and want to take this chance now to support them - to be able to reach out to more kids like Billy in their challenging times. My goal is $7,111. Billy's birthday is 7/11. This year I would like to meet my goal so that Ryan and Kelly can rappel in Billy's memory.